Animal protein vs plant protein. Lectins in uncooked beans vs salmonella in uncooked poultry. What’s the point of changing your diet? They’re all just as bad as each other. I think not! If you look through the research studies on the relationship between diet and chronic illnesses, such as diabetes, obesity, cardiovascular disease, cancer etc, you will see a consistent pattern: animal foods (meat, eggs, fish and dairy) are associated with increased risk and plant foods (fruit, veg, legumes, nuts and seeds) are associated with decreased risk. Animal foods appear to be the smoking gun – time after time. This blog looks a quick overview of just a bit of the evidence. And where there’s a smoking gun pointed at the corpse, who fired the shot? I suggest it wasn’t the boiled broccoli but the fried beef. Does the research bear this out? Where’s the beef? Look for the inflammation. 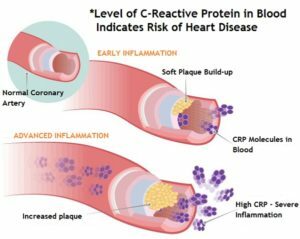 So what causes inflammation – animal or plant foods? So what about grains – do they inflame like meat? Best way of dealing with this one is by giving you some research data. A European Journal of Nutrition (EJN) article entitled “Consumption of Red Meat and Whole-Grain Bread in Relation to Biomarkers of Obesity, Inflammation, Glucose Metabolism, and Oxidative Stress.”4 concludes: “The results of this study suggest that high consumption of whole-grain bread is related to lower levels of GGT5 , ALT6 , and hs-CRP7 , whereas high consumption of red meat is associated with higher circulating levels of GGT and hs-CRP. Of course they don’t. But here’s some of the research data. A 2010 Journal of Nutrition article10 concluded that women who consumed a serving or more a day of whole grains had a lower probability of having moderate or elevated hs-CRP7 , according to the AHA (American Heart Association) criteria, compared with non-consumers. 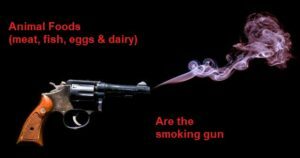 The smoking gun is always meat, not plants. I know that this is a pain in the rump steak of most meat-eaters, but it appears to be facts-based. I will leave you with a meta-analysis from the Journal of Nutrition13 which concluded that those consuming grains (rather than meat) had a 26% reduction in the risk of type-2 diabetes and a 21% reduction in the risk of heart disease (independent of known CVD risk factors). Furthermore, there is an inverse relationship between whole grain intake and weight gain. That is, eat your whole grains and you will lose unnecessary/unhealthy (fatty) weight. Examples of whole grains included whole wheat, dark bread, oats, brown rice, rye, barley, and bulgur. 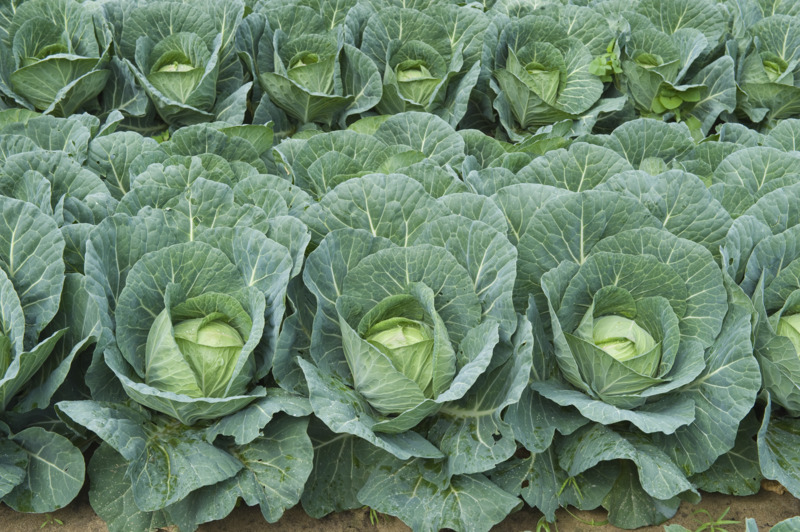 It’s always a question of facts or, perhaps better said, the preponderance of facts (in a media-controlled technological world), and you can decide for yourself, admittedly based on my rather arbitrary-selected range of studies, who is holding the smoking gun – Colin the Cabbage or Peter the Port chop?